Thanks for the well-wishes, guys! I feel much better now. Now there may not actually be a comic on Friday because I got all messed up thanks to the sickness, but there will be a nice surprise of some sort! Derk is afraid of heights because he’s always the one who falls down into the dungeons/basement. Or the sub-basement. Considering he looked down before finishing his own sentence, he was probably going to say “Don’t look like an idiot” or some other Skärvism. Does having Dark Magic surrounding you make it harder to see? Being levitated would only be freakier for me. Have you ever been on one of those freefall things, where they attach you to a harness and you just step off the edge of a tower? Even though you’re gently lowered to the ground and it’s not a far drop, it’s really, really freaky. You want nothing more than to cling to the cable (and they won’t let you, because apparently that’s unsafe!). 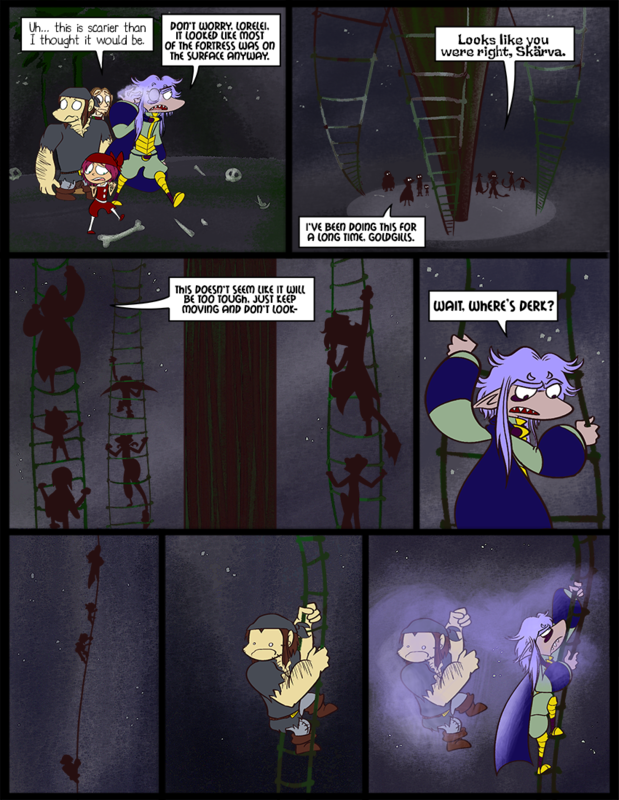 In the end, I’d rather be able to hold onto a rickety ladder than have to hold onto nadda. Derk is too paralyzed with fear to even realize what’s going on. But when he comes to his senses, you know… I think he actually trusts Boss enough to feel safer than otherwise. Looks like Skarva’s genre-savvy is showing! Cover that up, man, nobody wants to see that! When it comes right down to it, Skarvs would do as much for Derk as Derk would for him. Now that’s true friendship right there. Skärva just does it with more frowny-face. Everybody’s talking about what he did for Derk, but don’t forget that he also reassured Lorelei instead of brushing off her fears! Come Skearva, Levitate yourself! I know you can do it! That second panel, awesome yet slightly creepy at the same time. Also, poor Derk. Though in the meantime I have to find a way to get “a pirates life for me” out of my head. Does Derk have some sort of secret backstory that hasn’t been revealed yet? Yup! See, Derk is actually half Lurkin. That’s why his eyes are like that. His parents were ashamed of him, so they abandoned him at an orphanage. That’s why he knows Blank, they grew up together. ….okay, probably not. But that would be fun. That’s your idea of fun? Yeah. I’m pretty evil on Fridays. Well, no super dark secrets or anything… except that one thing that he doesn’t like to remember. There’s a lot about all the characters that you don’t know! I’m with Derk there. Being a big person on a moldy old rope is not exactly a situation with a bright outcome. Animating Snowmen with Dark Magic is the best thing for villains to do.